Gurung's wife and GJM Mahila Morcha chief Asha, his close aide and party general secretary Roshan Giri and seven others were also suspended for the same period. DARJEELING: The Gorkha Janmukti Morcha central committee today suspended for six months the absconding party president Bimal Gurung, a day ahead of an all-party meeting called by Chief Minister Mamata Banerjee. Gurung's wife and GJM Mahila Morcha chief Asha, his close aide and party general secretary Roshan Giri and seven others were also suspended for the same period, Binay Tamang, who was appointed the party's new president, said. Anit Thapa was made general secretary and other vacant posts in the party would be filled soon, Tamang said at a press conference after the meeting held at Ghoom near here. Tomorrow's all-party meeting has been called by the chief minister to discuss the current situation in the hills. 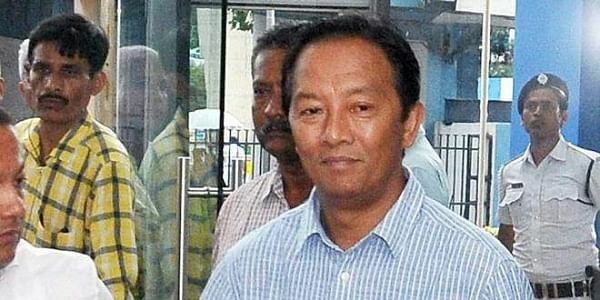 Gurung has been absconding since August after the state government lodged cases against him under the Unlawful Activities (Prevention) Act for his alleged involvement in bomb blasts in Darjeeling hills during the over three-month- long shutdown for a separate state. The 104-day shutdown was called off on September 27. While a faction of the GJM supports Gurung, the one being backed by the state government is led by Tamang. Tamang himself was expelled from the party in a central committee meeting headed by Gurung at an undisclosed location in September. Later that month, the state government formed a nine- member 'Board of Administrators' to run the Gorkha Territorial Administration (GTA) and appointed Tamang as its chairman. All 45 elected members of GTA including its chief executive Bimal Gurung had resigned in June when the agitation had begun.